Kwantlen Polytechnic University’s Social Justice Centre (SJC) is at work to better understand the issues of homelessness and addiction in Surrey, particularly on 135a Street, where inequality in the city is most visible. 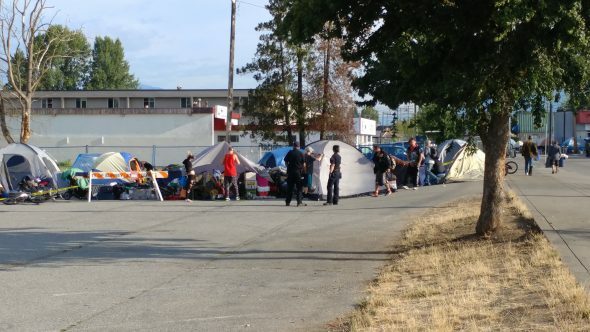 KPU criminology professors Michael Ma and Mike Larsen have set out to understand the circumstances of people living on 135a—colloquially known as the Strip—and the strategy employed by the city to provide outreach as part of their involvement with the SJC. Ma is particularly interested in collecting empirical evidence of what he believes “is already well established anecdotally” within this community: homelessness, addiction, mental illness, housing, and entering into recovery. The Strip has long been a site where Surrey’s homeless have set up camp. In January 2017, the City of Surrey began a pilot project called the Surrey Outreach team consisting of 12 RCMP officers and four city bylaw officers. Along with organizations such as Fraser Health and BC Housing, they were dedicated to providing services in the area around 135a. Ma stresses that the purpose of his study is not to ask what the City of Surrey is doing wrong in regards to outreach but to understand the realities of substance use and homelessness there. He developed a 41-question survey that was vetted by various experts —such as former B.C. Chief Medical Officer Perry Kendall and officials from Fraser Health—to reach that goal. People living on the Strip were given $10 to spend 10-15 minutes answering questions related to their living situations, drug use, overdose history, desire for treatment, and willingness to use social housing programs under various circumstances. So far, 80 people have been surveyed, and 200 more will have participated by the time the survey concludes. Ma says that the preliminary results of his survey don’t reveal anything surprising about people living with homelessness and addiction in Surrey, but they do provide hard data on issues that have been understood unofficially. 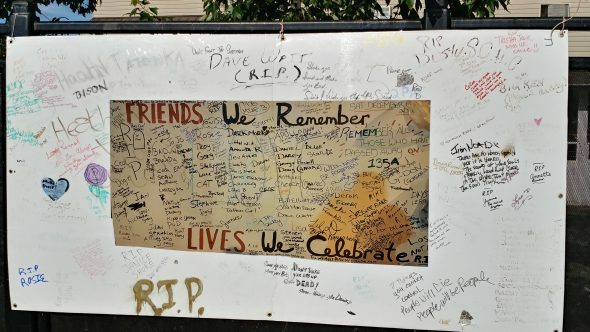 For example, the survey shows that about 80 per cent of people on the Strip have experienced overdoses, with each of them having overdosed an average of five times. As President of the BC Freedom of Information and Privacy Association, KPU criminology professor Mike Larsen was asked by KPU’s Social Justice Centre to help acquire information about the City Centre Response Plan via a freedom of information request. Larsen and the SJC requested background information on how the city’s plan came together, how much is being spent on these issues, and how the program’s success is being measured. According to Larsen, all of this information should be made readily available by the city. Larsen says that the most surprising revelation from his FOI request was how extensive the surveillance is on 135a. While no personal information was disclosed in the documents provided, the information acquired from Larsen’s request reveals what he describes as a “pretty comprehensive plan to monitor people who are homeless in the Surrey Strip area.” The response to the FOI request suggests that city is keeping close tabs on the residents of 135a for the purposes of housing and safety. Also surprising, according to Larsen, is how often BC Housing and various shelter organizations monitor those who use their services. A housing tracking table documents how close each service recipient is to receiving stable housing. This has made Larsen question who exactly is able to access this information, and he plans to send a separate FOI request to find out. The Surrey Outreach Team pilot project will conclude in January 2019, after operating for two years. From there, it will be up to the city to decide if it has been successful enough to be continued. While reports from the FOI request show data on arrests made in the area and other relevant information, Ma and Larsen both want to know more about how the city is tracking the pilot program’s success. Ma says that, at the end of the Outreach Team trial, city officials will need to ask themselves hard questions. Surrey City councilor Vera LaFranc declined to be interviewed by The Runner for this article and has expressed concern over the nature of Dr. Ma’s survey, citing privacy issues on behalf of the residents of 135a street.